Thomas, paid enforcer in the Cloverleah Pack, was carrying a lot of guilt. He still believed he was to blame for letting Wesley get targeted by the dark elves, almost causing a rift in Cathair and Marius’s mating. The alpha Kane, told him it wasn’t his fault, and Cathair and Marius came through the experience battered but not broken, but Thomas still felt as though he had to prove his worth to himself and the pack. He spends many hours patrolling long after the rest of the pack had gone to bed, determined to do something worthwhile. It was on one of those patrol nights he hears a ruckus outside the territory wards. Dithering as to whether he should help or not, he gets the surprise of his life when his true mate falls right through the magic designed to keep everyone not pack, out. Ivan was carrying secrets; the main one tucked up in his battered backpack. After a six month long mission to find the Cloverleah pack, he was as surprised as the next man when he fell onto pack grounds and into the arms of his true mate. Unfortunately, other pack members, still emotionally scarred by Wesley’s betrayal, didn’t view his “break in” quite so favorably and Ivan ends up in the Cloverleah cells. Meanwhile, the dark elves are getting closer and more brazen in their efforts to ensnare the Cloverleah pack. Pack tensions are running high and something needs to be done and soon. Through it all, Thomas and Ivan have to navigate their mating and learn to trust in each other. Secrets will hit the light of day and life for the Cloverleah pack may never be the same. As for Thomas and Ivan – time is running out for them too. A chance arrow, a ray of sunshine; will it mean Ivan and Thomas will get their HEA or will they fall at the last hurdle along with the rest of the Cloverleah pack? My Treasure to Keep is the twelfth full novel in the Cloverleah pack (there are also two shorter works, which is why this is labeled on Amazon as number 14). It is advised to read the previous books to gain an understanding of the secondary characters and main plot lines. 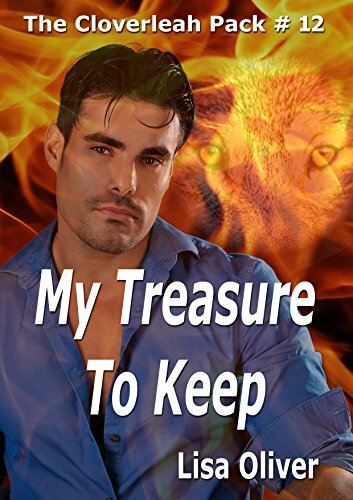 This is an M/M paranormal story featuring true mates. Warnings include graphic language, intimate situations, and some violence. Not intended for readers under the age of 18. Absolutely love this series, again Lisa Oliver did not disappoint! This story on paranormal is filled with intrigue, a really awesome battle of good versus evil and so much more. I give this book a five stars rating for such a detailed storyline that entertains and keep one wanting it to never end. Another keeper to read over again. I love that with each new book, in this series. That their mates are so unique to the pack. There are just so many different but perfect mates. Ivan is yet another unique one. But as always they are what the pack needs at just the right time. This pack has been through a lot but as long as they have love, they will be ok.
As always Oliver draws you into her fantastic world from the first page and doesnt release you till the end. Thomas and Ivan were perfect together and the climax of the long running story arc finally arrived. Cloverleah is one of my favorite series and this was a fabulous additions. It pains me know the next in the series is probably the last but ill still be serriously anticipating Wesleys story. The bonds of love, family , and friendship in this series are beautiful and inspiring, it was great to see those relationships highlighted so much in this one. You definately need to read this book but start at the beginning of series and dont forget the cross-over series the God Made Me Do It because the series is so amazing you want the whole thing.